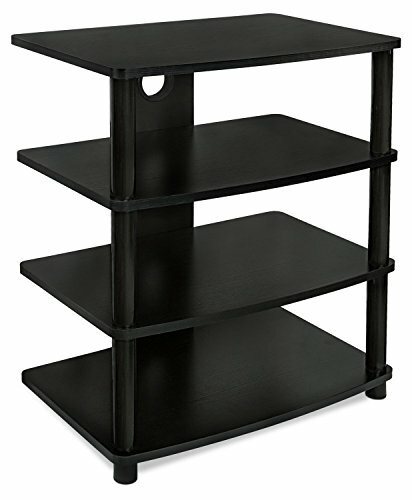 Looking for a black luxurious hardwood multi-level media component stand to complement your TV? Mount-It's Audio Video four tiered tower is meant to bring convenience, style, and function back into the contemporary home. The black silk melamine compound shelves and steel supports provide a stable organizing tool for your sound systems. The large gaps between the tiers create a healthy space for your equipment, ensuring that they don't overheat or operate at an unsafe temperature. The alternative benefit to the open space design, is the ability to reach your products easily and conveniently without unplugging, unmounting, opening, or closing anything. Unsightly cables no longer need drilling, zip tying, or fastening because our AV stand is constructed with cable management in mind. The holes located on the rear provide the primary leads for your cables. As an alternate method, you can make this a corner piece and feed the cables down the edge of the furniture. This is a great clean center piece for your living room or fits nicely adjacent to a cabinet or desk. All four tiers can create a number of combinations to suit your specific needs: audiophiles can store mixers, controllers, amplifiers, switchers, routers, and pre amps. Common applications are for home theaters, gaming, speakers, amplifiers, cable boxes, servers, PCs, and TVs. * Supports Flat Panel TV's up to 88lbs. FLAT PANEL TV STAND - This media console is ideal for AV component storage around your TV. It is made for storing stereo equipment, center speakers, gaming consoles, DVD players and streaming devices. HEAVY DUTY AUDIO TOWER - With 88 lbs of carrying capacity, you can store your receiver, stereo and audio equipment, home theater speakers. SHELF DIMENSIONS: 24in (wide) x 15.5in (deep) x 27.75in (tall). The shelves are all separated by an even 8 in of space for larger components and increased air flow.